Conex restrooms reduce cleaning time and improve morale. 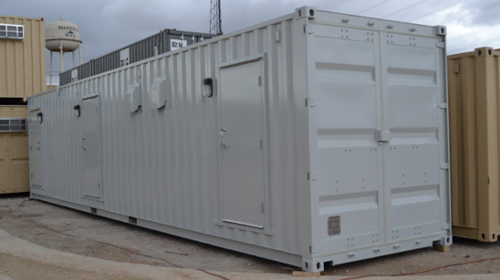 One of Northern America’s largest offshore oil construction, mining and engineering organizations approached Falcon to create an easy-to-clean shipping container restroom for their oil field employees. They wanted to provide their employees with a clean restroom to improve employee satisfaction and retention. When you think about restrooms on an industrial jobsite or oil field, the word unsanitary probably comes to mind. Traditional mobile restrooms and porta-potties often come up short in cleanliness, comfort and durability. Fortunately, restrooms or "comfort stations" constructed from modified Conex shipping containers provide a long-lasting and easy-to-clean solution. Today, our modified shipping container restrooms are in the field working wonders for employee morale and work site efficiencies. Traditional comfort stations rarely come equipped with heating or air conditioning. All of our shipping container restrooms include fully operational HVAC systems. Climate controlled restrooms give employees a much-needed break from the heat and cold outside. When workers are more comfortable, content and refreshed, they tend to be more productive and more likely to remain at their jobs. All restroom units include private stalls. 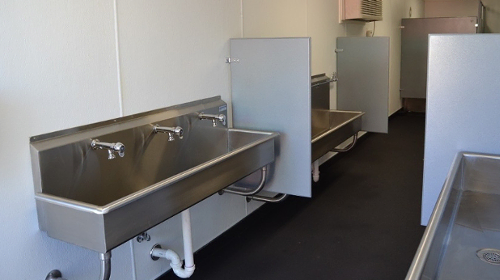 The men's units also include a urinal to accommodate high-traffic periods. Motion-activated vent fans, indoor LED lighting, and photocell lighting to reduce energy costs and increase energy-efficiency. To ease the cleaning process, shipping container restroom interiors include durable features that resist soiling and can be hosed or mopped down. The reduced cleaning time lowered related expenses. Providing a more desirable workplace can give employers an edge when recruiting and retaining quality employees. Shipping container restrooms help support this goal, while improving productivity and keeping operational costs in check. Waterproof, slip-resistant, flooring with 2” drains. Stainless steel toilets, urinals and sinks. ¾”. Easy to clean, FRP-covered, plywood walls. State-of-the-art Dyson AirbladeTM hand dryers to reduce paper waste and enhance hygiene. Although this customer did not opt for ADA compliant features, Falcon does offer them for restroom buildings that will be used by the public. Security features offer peace of mind. We can equip all exterior doors with either a secure card swipe or a keypad. Workplace security features on our bathrooms allows employers to monitor who enters and leaves the comfort station. Both men’s-only and men’s/women’s combination units are available. The combination units are separated by a floor-to-ceiling wall and include separate entrances for added security, ensuring only authorized personnel can enter. Have questions about a mobile conex bathroom? Contact us at 877-704-0177 or sales@falconstructures.com.